Want to Keep Your Acrylic Fish Tank Looking Sharp? Follow These Simple Guidelines! There’s a lot to love about owning an acrylic aquarium. For one thing, acrylic is stronger and more flexible than glass so that it won’t shatter or leak as easily. It also weighs less than glass, which makes it simpler to pick up and move around. And, of course, you can’t beat that crystal-clear view! Of course, with all those benefits comes a drawback. Unfortunately, acrylic aquariums are very easy to scratch, which can make cleaning them a nerve-wracking experience. But it doesn’t have to be that way! 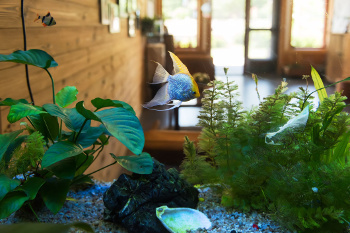 Here are some helpful tips for a safe and scratch-free acrylic tank cleaning! For safe cleaning, you need to invest in products that were specifically designed for acrylic. Instead of a course old sponge, you should use a soft cotton cloth and plastic scraper to give the walls the delicate touch they need. There are also plenty of acrylic-safe liquid polishes on the market that will make the outside of your tank shine. Wiping down the walls of your acrylic aquarium is a delicate process, so don’t scrub too hard if you come across a tough spot. Putting more pressure on your scrub will likely lead to a scratch or scuff mark. For removing particularly caked-on algae, you can use a plastic scraper. Just make sure you never scrape at an angle with the wall because that’s a great way to scuff it. Always place your scraper flush against the wall and gently rub the spot away to avoid scratches. Nothing can torment the walls of your acrylic aquarium quite like a grain of sand. While one little particle may seem minuscule and harmless, it is anything but when it gets caught between your scrub pad and the wall. To avoid accidentally scratching your aquarium with sand, you should rake all sand away from the tank walls before cleaning. And be careful not to stir up any particles when polishing near the bottom of the tank. While we’d like to tell you you’ll probably never scuff up your acrylic aquarium, chances are you probably will at some point. But a scratch is not the end of the world! There are plenty of products out there you can use to buff out scratches. Whatever product you choose, be sure to follow the instructions on the label. Keep in mind that fish are delicate and exposing them to any liquid products will likely kill them. So, above all else, be careful! 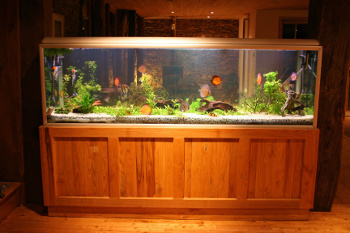 Do you need help cleaning your acrylic aquarium in Crystal Lake IL? Living Art Aquatics is here to help! We provide the products and services you need to get the job done right. Give us a call at (847) 737-5151 and never have to worry about scratching your acrylic tank again!